My friend Oi ( pronounced O-ee) had ideas so advanced that even Quaker Meeting – that most liberal and open- minded Christian group – threw her out. She was born in 1900, the youngest of ten, to a father who was sixty years old, and she died when she was a hundred and four – so the two life-times covered a hundred and sixty four years, and went back to 1840. 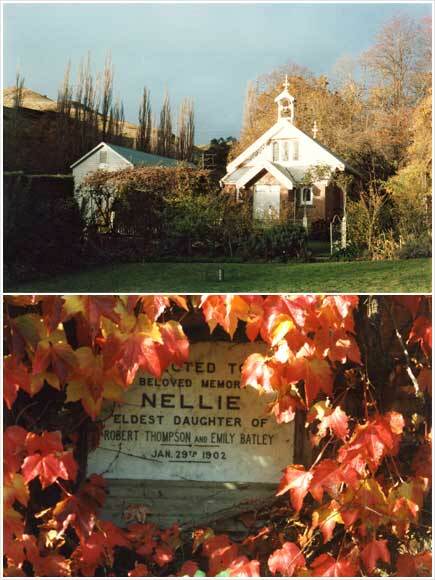 Her father was a cabin boy on a ship that was wrecked on the NZ coast in 1856. Local Maoris formed a human chain to rescue him, and he stayed with them for some time, becoming very close to the chief. After returning to England, he came back with a seventeen-year-old bride, and the Maori chief gave him land to start his life here. Robin, Oi’s father, established a huge sheep farm, built a big beautiful house, cottages for his shepherds, barns, wool-sheds and an exquisite little chapel, where Oi and her nine brothers and sisters played the organ and helped hand out prayer books to the shepherds and their families as they entered.. As each child arrived, the generous chief had given them Maori land. He ceremonially adopted Oi, and gave her the Maori name Oiroa, which roughly translated, means: ‘compassion for those in need’. Though it was shortened to Oi, she lived up to her name always, and when I met her was beloved by many people for very good reasons. She married a distinguished Auckland architect – sometimes known as NZ’s Frank Lloyd Wright – who created many of Auckland’s great buildings, like the Railway Station, and beautiful private homes including some famous ones in the Hawkes Bay. Oi herself was very musical, and played the piano, and was so deeply involved in the musical life of her adopted city, that in the early thirties she and another musical aficionado, started the first orchestra in the city, whose descendant is still thriving. Throughout her life she was drawn to mysticism, a branch of the spiritual life which has always been mistrusted by organised religion, as its devotees seek union with the Source, whatever it is called, thus bypassing the need for priests, mullahs, rabbis, gurus or whatever. Whether these mystics were Muslim, as in the case of Rumi and the Sufis, or Christians like Master Eckhart, or St John of the Cross, they often came to a sticky end at the hands of their respective religions. When the children and I were there, we‘d often end up singing round the piano with the student who boarded with her, and was a brilliant pianist and lovely tenor. We’d all sing favourites as diverse as Handel’s, ‘Where e’er you walk”, to: “Feed the birds,” from Mary Poppins. I had another musical friend, Phillipa, whose unbearable life (a romance I ‘ll tell another time) was slightly improved by taking clarinet lessons, and since her ambition was to play in an orchestra, she needed practice playing with others. Hearing about her, typically, Oi offered to play with her, and through music-making, they learned to love each other too. I was spending the day with Oi when I learned that the ship Phillipa was sailing on had caught fire, and she and her two small children, one handicapped, plus her six-month-old baby, were adrift in a lifeboat in a violent storm. I never saw them again. So it was that her funeral – which was attended by all those people from all walks of life, whose lives she had touched with love and compassion – was a very traditional one… which slightly puzzled me, as I was sure Oi would have wanted something different. At the end her family left, and only five of us gathered round Oi’s coffin as it was lowered into the void – the student – now a judge, her cleaning lady for the last twenty years, my two now grownup children, and I.
I suddenly remembered how Oi, when she was too old to cope with driving in inner-city traffic, had asked her lawyer to call in and take possession of her will for her funeral. She had showed it to me – an exquisite collection of sayings on love, from mystics of all faiths. To my horror, the lawyer had charged this beautiful old lady in her mid-nineties, an exorbitant fee. Standing by her coffin now, the judge wept over this betrayal of Oi’s wishes. “One more thing for her to forgive her sons for,” he sobbed. We all wept with him. Before she died, Oi gave me the books which had sustained her, and influenced her thinking, and which had helped her find her path to expanded consciousness and freedom. One of the joys of reading them was that she’d underlined or marked the passages which sang to her. Not only did I find this a wonderful aid to a deeper understanding, both of the texts and of Oi, but it also taught me the pleasure of marking and making my books my own, which I had never dared to do before. She’d quote T.S. Eliot: “It is not our business what others may think of us,”… or: “God wastes nothing”. She’d say : “Let go and let God.”… and, “Happiness is like water in the palm of your hand. If you gently hold your palm open, it will stay. But if you clutch it and try to hang onto it, you lose it.” She died thirteen years ago, but her loving wisdom sustains me still.